Self-Drilling Screws. Commonly known by the brand name TEK® screws. 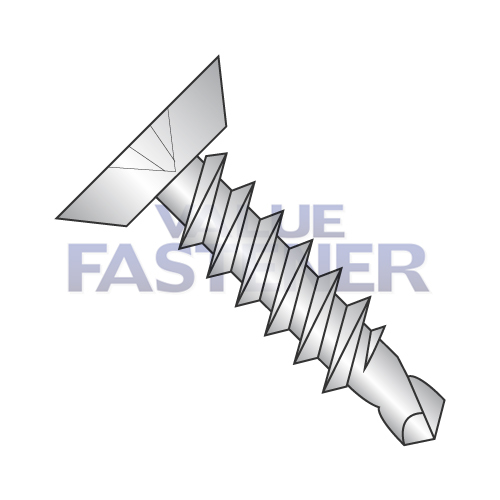 Value Fastener offers a full line of self-drilling screws, with a wide variety of head styles and finishes that makes it easy to find the right option for nearly any application. Our TEK® screw equals feature special pointed ends that allow them to penetrate thin materials without a starting or pilot hole. These self-drilling screws cut their own threads for a secure grip on the mating material. Generally, TEK® self-drilling screws are used for metal-to-metal or metal-to-wood connections, and are most commonly used in thin metal applications such as working with steel studs. Value Fastener offers TEK® screw equals in 19 different head styles, with steel and stainless steel screws available to meet your needs. Available head styles include countersunk, hex, oval, round, pan, and more. Multiple finish options are available, including black oxide, green ceramic, and zinc plated screws. Follow the links above to find the Self-Drillin screws you need, or use the filters at left to narrow your search by size, length, material, finish, or other factors. See individual product listings for additional information and specifications. Value Fastener is your #1 source for equivalent TEK® self-drilling screws and other reliable fastener products. Order today, request a quote, or contact us for the TEK® Self-Drilling screws your application requires.